Ideal positioning AFO to treat mild plantarflexion (< 15 degree) contractures of the ankle / foot. 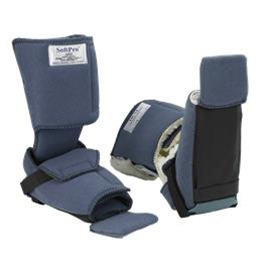 This recumbent device comfortably maintains the ankle / foot in neutral while protecting the heel. The semi-rigid insert can accommodate a plantarflexion contracture of up to 15 degrees. Orthotic therapy for mild contracture or abnormal tone and spasticity of the ankle and foot. The AFO is made of a flexible material, and will provide a gentle dorsi-flexion stretch of the ankle / foot. Ideal for bedbound patients. Adjustable toe post protects the toes; hip rotation bar can be used to treat internal / external rotation of the hip. The SoftPro™ In-Bed AFO has a non-skid pad sewn into the bottom of the AFO cover to facilitate transfers without having to remove the AFO. Small Fleece SP 10-00 6" - 8" 15"
Medium Fleece SP 10-00 8" - 10" 17"
Large Fleece SP 10-00 10" -11" 19"
Xlarge Fleece SP 10-00 11" - 12" 23"
Small Smooth SP 10-50 6" - 8" 15"
Medium Smooth SP 10-51 8"- 10" 17"
Large Smooth SP 10-52 10" -11" 19"
Xarge Smooth SP 10-53 11" - 12" 23"